Life, Doctor Who & Combom: SFX Reveals 'Doomsday' Farewell Scene as "Greatest Moment in Sci-Fi"
SFX Reveals 'Doomsday' Farewell Scene as "Greatest Moment in Sci-Fi"
SFX, the world’s number one sci-fi and fantasy magazine, today unveils its definitive list of the 250 Greatest Moments in Sci-Fi, Horror and Fantasy to celebrate the magazine’s 250th issue! From cinema to television, books to comics to video games, readers voted in their droves. With 96,300 votes cast, Britain’s very own favourite sci-fi programme, Doctor Who reigned supreme with the moment The Doctor and Rose say farewell at Bad Wolf Bay in “Doomsday”. Elsewhere in the poll, the scene from Avengers Assemble in which The Hulk destroys Loki, comes in second place, while the notorious ‘chestburster’ moment in Alien takes third place. SFX has recruited some of the biggest names in the world of sci-fi to share their favourite moments, with Buffy The Slayer actor Anthony Head, and Directors Robert Rodridguez and JJ Abrams all in agreement that the scene in Alien was their greatest. Anthony Head says: "The first thing that comes to mind is Alien, the great exploding John Hurt moment! You didn’t hear until afterwards how they filmed it, and it was one of those moments of reality really hitting a group of actors. You believed it. So full on. It was a perfectly formed science fiction film, and it's always stuck with me. I was very scared." 1. 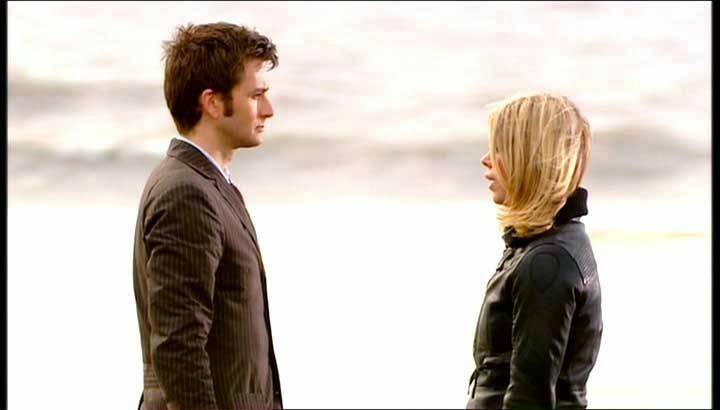 DOCTOR WHO The Doctor and Rose say farewell at Bad Wolf Bay in "Doomsday"
7. GAME OF THRONES The Red Wedding: "The Lannisters sends their regards"
10. BACK TO THE FUTURE "Where we're going, we don't need roads"
The full list is printed in issue 250 of SFX, on-sale now. And it was TOTALLY undone by the repeated returns of the Boomerang Blonde! I'll bet you're one of those Nu-whos who think the Doctor and Rose should go off in the TARDIS and make Timetots. Gads, I hate shippers. No, I'm not one of those, I'm just not so closed-minded either.. I still think David's "I don't want to go" was 10 times better than Doomsday. That had so many feels! Look, I didn't have a problem when it originally aired. My problem is that RTD set up this whole ending and said flat out that Rose couldn't come back without imploding two universes then undermined the whole thing by having her come back 4 more times. It's called CONTINUITY! Davies screwed up his whole canon and then you get all these folks screaming "Fire Matt Smith, bring back Rose and 10!" Davies is a hack soap opera writer and it shows. I'm glad he's gone. I've gotten to the point that I can't stand Rose because of all the shipper nonsense. And don't get me started on the "I ran out of money/ideas for the Davros episode so quick find an ending - even if it doesn't make a lick of sense" You don't like my opinion? I don't care.